Les and Diane Armstrong have traveled far in their journey as Houston TX entrepreneurs. Les started out as an auto mechanic. Diane held various admin positions. There was a church picnic one day. Les got injured playing softball at the picnic, spent time in the hospital, got out. The story of Les and Diane turns on what happened next—which we’ll come back to later. 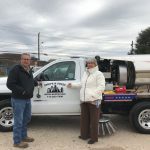 Fast forward to the present, and the Armstrongs are the owners of a thriving business that has been serving customers throughout the Houston metroplex for more than 33 years. But, what happened after he healed up from the sports injury? Picking up where we left off, his employer wouldn’t let Les go back to work after he got out of the hospital stay that resulted from his sports injury, so the Pastor at their church asked someone to give Les a job as a sweeper truck driver. Within a month on the new job, he was quickly promoted from his new role as a driver to manager. He credits that rapid advancement to his background as a restaurant manager. (Fun Fact: During Les’s restaurant days, Diane had worked as a waitress on his staff. That’s how they met. Adorable.) So, within another six months, his new employer promoted Les from managing sweeper operations to sales. After a year or so with the company, he went out on his own—and in September of 1985, he and Diane started Stripe N Sweep. Les recalls the startup of his fledgling sweeping service. I started with one Billy goat and a backpack blower and a lot of energy. I worked at night sweeping, and in the day knocking on doors, and cold calling everybody I could think of. I was very persistent, asking people to give me a chance. I was new in the business, but more customers came on, a few here and a few there, until I could afford a sweeper payment. In January 1986, I got my first Masco sweeper. I kept working sweeping and striping parking lots and going out selling whatever I could in those services. I hired my first employee in 1988. I was doing it all myself every day until then. In 1988, I added another sweeper truck. I added a truck in 1990 and another one in ‘91, ‘92 and ‘93. Things took off in that time period, because I had enough accounts that property managers were telling others about my services. We built up to about six trucks back then. Houston hadn’t grown to nearly the size it is now. But, I was working 16 – 20 hours per day sweeping, striping, selling, working on trucks doing maintenance, etc..
After he left, I was back to doing all the jobs again. I started subcontracting the striping. I was still selling it, but started subcontracting the work. In 2007, I was struggling to keep everything afloat. At that point, my wife asked if I wanted her to add sales to her other duties that she was able to do from home, managing the books, payroll, contracts, etc.. So, she came on, and she took on sales. Enter Diane – Hello Accelerated Growth! She started selling everything she could sell. Since then, we’ve grown every year. We hadn’t grown much in the late 90s and early 2000s. I think it had to do with the economy and everything that was going on with our company. Diane came on and was determined to quadruple the business, and she’s more than done that. She’s done it the same way I did—cold calling, seeing old customers, working the old accounts. We’ve lost accounts along the way, and somewhere down the road, they’ve called us back and asked us to come back. We never burn any bridges. We never close any doors, because we don’t know what’s going to be happening around corner. Now we have two mechanics working for the company. We have 12 routes, covering about 12-13 counties, including the Houston metroplex. Our service areas are from Galveston, all the way north to Huntsville, Conroe, Atascocita, Katy, Richmond, Rosenberg, Pearland, Pasadena, Baytown, Alvin, Lake Jackson, and everywhere in between. We run a lot of miles every night. We probably sweep is in the hundreds of miles per night. We service retail centers, parking garages, shopping malls, and other accounts. We sweep the Houston Medical Center lots and surrounding streets three or four nights per week. I think we have 20 employees, including the mechanics. We have a supervisor, Lewis Perkins, for about the past 10-15 years. Some of our drivers have been with us for more than 5 years, and some have been here 2-3 years, and we have new people who’ve come on in past few months. Our entire team does an excellent job. We went to a convention in Nashville a few years ago year for pavement cleaning, Les recalls. 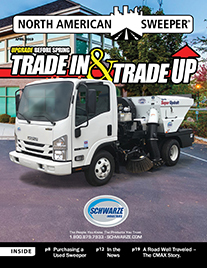 It’s mostly focused on asphalt, but they include information relevant to the sweeper business. One year, we learned there about GPS tracking. It was new technology then. Our company was the first in the Houston area to use it. With GPS, we know when sweepers are running, when they’re not running, which lots they’ve done. We can locate vehicles. If one is broken down, we know where it’s located. It gives us a minute-by-minute report. It can give you a screen shot of where the sweeper has been on a customer’s parking lot. Every minute, it shows you a different spot where it’s been. When we asked Diane about business forms, she’s created for Stripe N Sweep, in addition to the route sheets she designed, she mentions those mostly as tools of the past, and moves on to point out progress of office systems more generally at the company. Yes, I’ve created other forms besides the route sheets. When we first started, we didn’t even have a computer, hardly any small businesses did. We did everything on paper, typed out invoices, etc.. I had learned computer technology through previous jobs. As technology has changed, my customers, who are bigger than I am, can afford all of this high technology, and they expect us to keep up. They have portals, which we use to report services rendered on or accept contracts electronically. Now, the latest is that customers have apps, which we must use to report services in real time and to upload pictures. It’s necessary that we figure out the technology, so we can train all the drivers to use it. Our supervisor and office staff have been crucial in figuring out these ever-changing technologies. As for the route sheets, they’ve been the same for 20 years. The program we use is off-line on XP, and we back it up to a thumb drive every time we use it. I have Access, and am looking at options for migration to that or another database. Les explains the company’s position on generating prospect traffic. Outside of our simple little website on the internet, we don’t do much marketing. I’m a true believer that the best advertisement is word-of-mouth. People pass by and see us doing the work, and become aware of us that way. We think that also having a supervisor checking on the drivers and doing a lot of training to show drivers easier ways to do things provides the constant hands-on attention to customers’ properties that serves our business growth best. All of our trucks are numbered, and they have phone number and our logo on them. People can call to say they’re doing a great job, or they can make complaint. If there’s a problem, it gets handled right then. They call me (Les), and we do what it takes to correct it. On the sales end, Diane gets bids back to people within 24 hours. She doesn’t leave people waiting for 4 or 5 days. Asked about the cute logo sketched on the Stripe N Sweep website, Diane explains its origins and its future. At one time, it was on everything, but not so much anymore. My daughter Rebecca drew that when she was in high school. It’s always been our logo, and it probably always will be. Our supervisor, Lewis, travels about 150-300 miles per night on any given night. He does random checks for quality. So, our drivers are supervised, but unsupervised. As a driver, the quality of your work is being validated, but nobody is breathing down your neck. I think the guys who work for us enjoy that system. We have the route sheets Diane developed. Those tell the drivers where their first and last stops are and what they need to know in between to run their routes. A driver works an area of town for 4-6 weeks, and then everyone rotates around to different areas of town, so everybody’s routine stays fresh, less mundane and repetitive. I think a lot of drivers appreciate having a different environment every month to month and a half, and they also get to know the Houston metroplex. It’s like going to other large cities. There’s so much here, rotating to different areas opens their horizons to learn new areas. 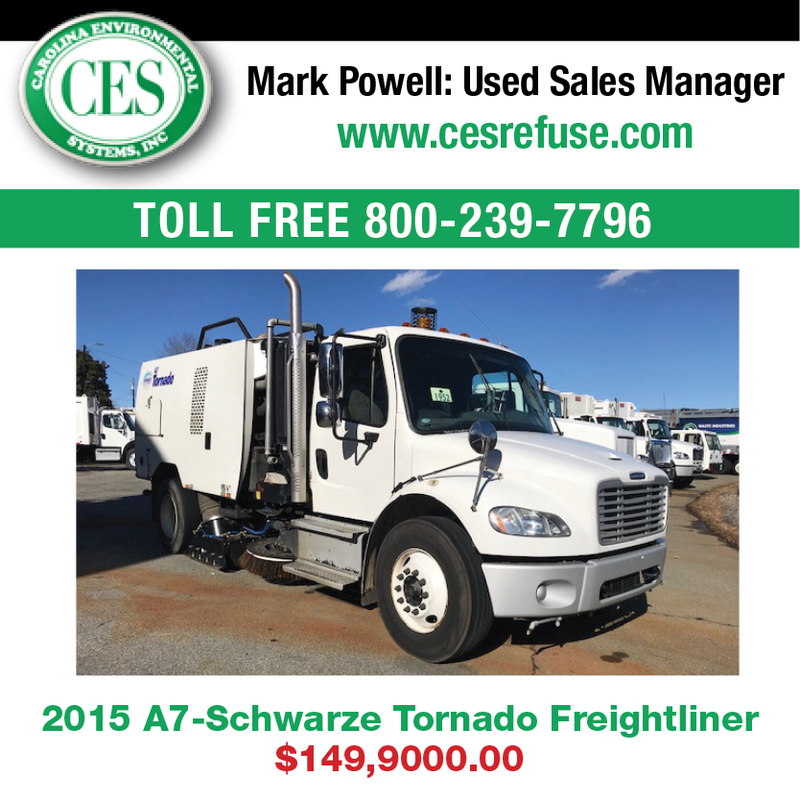 We currently have 16 Masco sweeper trucks, plus two Tymco435 construction sweepers mounted on Isuzu bodies. (We have a service person who handles the port and industrial places.) Every truck has a leaf blower, to help clean out the corners, as needed, and the drivers blow the sidewalks and curbs as part of regular sweeping. Diane explains how the office management works at Stripe N Sweep. I do payables and receivables (and sales). Rebecca, Les’s and Diane’s daughter, does employees’ timesheets, processes in new hires, handles insurance certificates and the 1001 forms that have to do with managing employees, and she enters all of the information through web portals. She also maintains our website, which she set up. We originally hired Rebecca to handle computer stuff. She knew the technology. As time went by, she took on more and more duties, all of which are very time-consuming. There are 10 different portals we have to get into every week, so that job alone is a big one. She manages myriad tasks. The sweeper business in Texas isn’t really regulated. There are no chemicals that have to be dealt with. Almost all of what we pick up goes into dumpsters and is taken to landfills. When it comes to the pressure washing, the contractors deal with the water reclamation, and it’s included in their pricing. It’s the same with striping and asphalt and concrete. The contractors are professionals, and they know what their industries require. When we asked about the most difficult challenges they’ve been confronted with over the years, we weren’t surprised to hear that Les and Diane have the same two issues that sweeper companies throughout the country identify as their top two: keeping the trucks fixed and finding and keeping good drivers. On the problem of personnel, Diane explains that finding people who want to work is an elusive goal. They’ll say, “Yes, I understand it’s a job working at night, and that there’s trash, and that it’s dirty work.” But, they’ll come for one night and then realize it’s not for them. They often don’t appreciate what’s involved. In some cases, the supervisor has brought a backpack blower into the interviews, to help applicants understand what the job involves. We asked Diane, how did you get all those sales and grow the business so robustly? Were you some sort of sales phenom from another industry before selling for your own business? Her explanation, characteristic of great entrepreneurs, was classically simple. To be honest, it was mostly prayer. I’m very serious about that. We had gotten into a place where we were in a pretty tight spot and things needed to change quickly. Our oldest son had just graduated from high school. I had been working at the school part time. I had always been afraid of sales, I was really intimidated. I didn’t think I had a good background to go out and talk to property managers and building owners. Then, I realized that our business was really lacking from me being out in our bedroom community in the country. I had an office at home, and we had a lady here in the business office who helped with some tasks. But, I wasn’t coming in every day. We started the business as a team, but had not acted as a team for some years. Sales had become so slow that we were thinking we might have to close the doors. I had been working at a real estate business, after leaving the school, watching people selling expensive properties. It dawned on me that if they could sell whole properties, I could sell sweeping jobs. I’m a firm believer that you’re given every experience to help prepare you for the next. But, I needed an opening. I didn’t think I could just go in and cold call. I don’t think that would have been successful for me. And, I needed something to do with my hands. So, I went to a local shop and picked up several jars of honey or jams, and I took those with me, and that was my icebreaker conversation starter. It helped me get one-on-one with people and start to sell. When we were starting out, I took our boys, wearing their cute outfits, to bring candy to property managers at Easter or Valentine’s Day. People would say they had been meaning to call, and would add more business. People often put things off and just need something to jog their memories. Response was immediate. Within just a couple of months things picked up, and we were back in business. There was just so much prayer involved in that, because I had so much fear and uncertainty. Some of our customers were growing. We have 20-30 customers that we had around that time, and as they’ve grown, we’ve grown. Les reflects on his entrepreneurial career in the sweeper business. l’ve been doing this for 35 years; I love it. Though it’s the same every day, it’s different. To me, that’s refreshing. Many people go into their job every day and have the same thing happening and feel that they can’t do anything about it. I’m also fortunate to live in the country, an hour away from my workplace. I have the peace and quiet of the country and go into the city for the excitement every day. I enjoy what I do and my city-and-country lifestyle, and that’s important. So, I recommend doing work you enjoy, and live where you’re happiest. I could talk sweeping for hours. My advice is for people starting out in the business to get the equipment that is best for them to use—and if they want to talk sweeping, over a cup of coffee, come and see me. Diane adds her own words of advice for new entrants into the sweeping market. I would say, if you know what sweeping is, and this is what you really want to do, and you’re willing to sacrifice your nights to get it off the ground, don’t pay any attention to what anyone else is doing. Just follow your own direction. We started because we thought we could do it better than others. The only thing I’m interested in is what we’re doing. Are your team members being polite, adhering to the laws, doing a quality job? Those are important concerns for businesses in our industry. Don’t worry how many properties or trucks someone else has. All sweeper businesses are hard and expensive to operate. If it’s what you feel like you’re called to do, then put your pedal to the metal and don’t get distracted with what others are accomplishing. That will just slow you down. Focus on your thing. Be out there working on generating your own growth. Don’t be the guy checking to see where Michael Phelps was during the race at the Olympics. Be Michael Phelps! 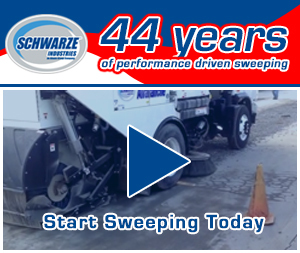 Our time talking with Les and Diane reveals that the Stripe N Sweep ownership team sets high standards for themselves and their team in all aspects of their operations. Diane expresses the couple’s sweeping business quality management philosophy as simply a matter of insisting on meeting customer expectations of cleanliness and reliability. To say more about the high benchmark that their company has set for reliability and quality service work in their region would probably have a ring of overstatement to this pair of exceptional sweeping service business owners. They would prefer to present their company as a team that is just doing its best to provide the very highest possible quality of service. 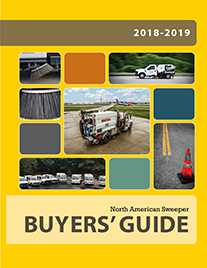 Talking to sweeper business operators throughout the United States, we recognize this particularly high level of quality commitment. On that basis for observation, the Armstrong’s Stripe N Sweep operation can be fairly viewed as an example of excellence in sweeping services quality in their region. The company’s reputation and its many years of setting the example of top-quality service in the Houston area, is indeed likely to make it difficult for other companies to match the standards the Armstrong’s maintain.